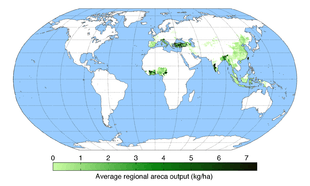 For other uses, see Areca (disambiguation). 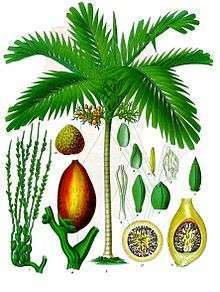 The best-known member of the genus is A. catechu, the areca nut palm. Several species of areca nuts, known for their bitter and tangy taste, raw or dried, are routinely used for chewing, especially in combination with the leaves of betel and dried leaves of tobacco. Dypsis lutescens, a plant also sometimes referred to as "areca palm"
↑ Areca catechu - the Areca palm. In botanical drawing from Köhler's Medizinal-Pflanzen - by Franz Eugen Köhler, in 1897. 1 2 3 Charlie D. Heatubun; John Dransfield; Thomas Flynn; Sri S. Tjitrosoedirjo; Johanis P. Mogea; William J. Baker (2012). "A monograph of the betel nut palms (Areca: Arecaceae) of East Malesia". Botanical Journal of the Linnean Society. 168 (2): 147–173. doi:10.1111/j.1095-8339.2011.01199.x. ↑ "Zumbroich, Thomas J. 2008. The origin and diffusion of betel chewing: A synthesis of evidence from South Asia, Southeast Asia and beyond. E-Journal of Indian Medicine 1(3): 87-140". Retrieved 2015-02-25.